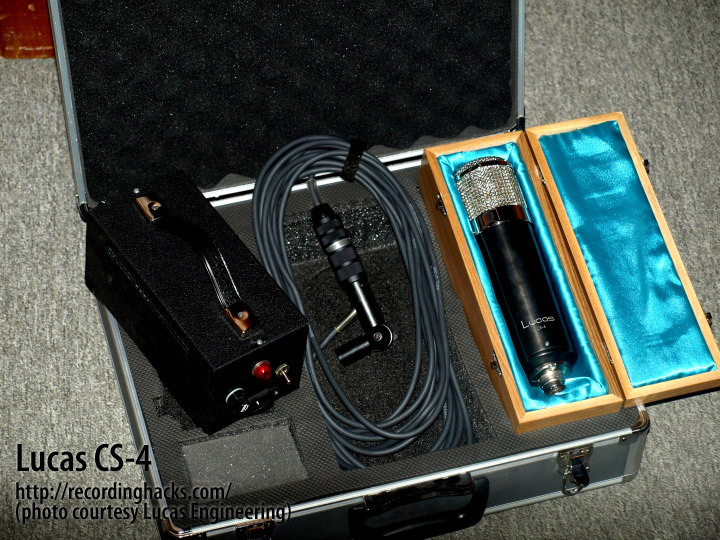 The CS-4 is a multipattern tube condenser designed by Oliver Archut and Terry Manning as a contemporary reinterpretation of the “sonically colored” family of microphones descended from the Neumann U-47. The mic is emphatically not presented as a U-47 clone, soundalike, or replacement, but rather as a high-end tube mic that the original Neumann engineers might build today. The diaphragms are treated with a moisture repellent to improve performance when close-miking vocals. The PVC diaphragm material is aged to meet the NWDR (Nordwestdeutscher Rundfunk) specifications for the Neumann M 49, to ensure the most consistent front-to-back response. 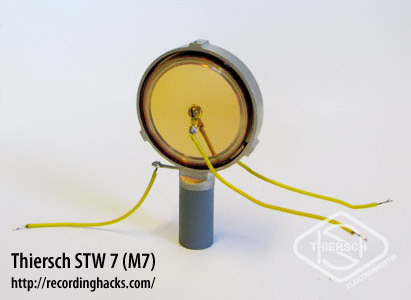 The Thiersch M7, aka the STW7, has a 32mm (OD) backplate. 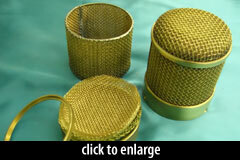 The membranes are made of ~6-micron PVC; the active area of the diaphragm is 25mm. A rotary switch on the power supply provides 11 discrete polar patterns: figure-of-8, Cardioid, and Omni, with four intermediate (hypercardioid-ish) patterns between Cardioid and Fig-8, and four intermediate (subcardioid-ish) patterns between Cardioid and Omni. Through Oliver Archut’s connections with former microphone and tube engineers in Germany, Lucas has been successful at locating “forgotten” caches of audio tubes — first the 7000 Mullard 6072a-like dual-triodes used in the CS1, and more recently, several thousand of the glass VF14-like Telefunken tubes used in the CS4. Lucas Engineering expects to maintain a supply of replacement tubes for registered CS-4 owners for the forseeable future. The transformer in the CS-4 is manufactured by AMI/Tab-Funkenwerk. 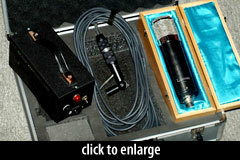 It is a version of the company’s BV8, fine-tuned for this specific microphone. 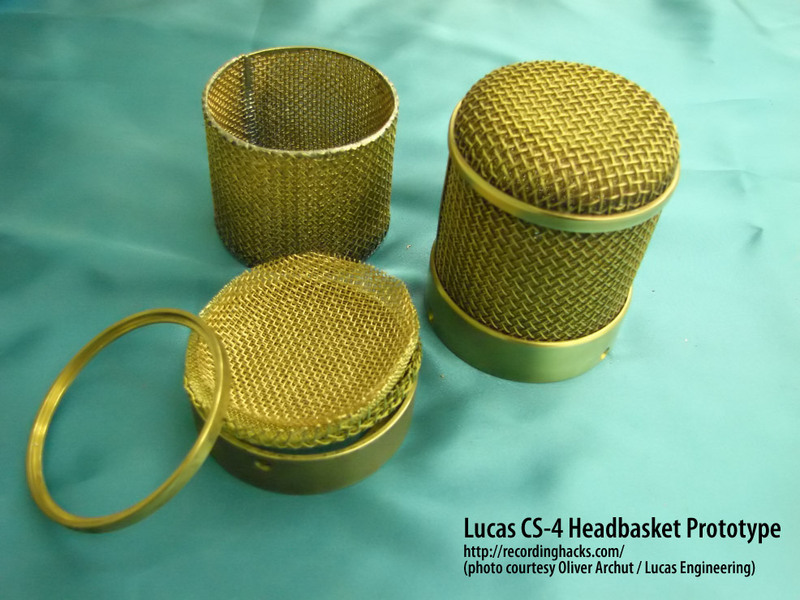 The prototype mic’s headbasket was fabricated by hand from three layers of brass mesh by Oliver Archut, then plated for display at the AES-NYC show in late 2009. As with the CS-1, the body of the CS-4 is a steel tube finished in the “Lucazite™” process by Jeff Roberts at Latch Lake Products. The physical dimensions of the mic, roughly 63mm x 240mm, match the “long body” style of the U-47. A maximum of 300 CS-4s will be made. The first units are expected to ship by late Spring 2010. Additional specifications for this mic are forthcoming.